On June 1, 1996 Stand for Children Day was held at the Lincoln Memorial in Washington, DC. Over 300,000 people attended the event and the rally was considered the largest demonstration held in American history focusing upon improving the lives of children. Among the speakers was civil rights hero Rosa Parks who was quoted as saying, "If I can sit down for justice, you can stand up for children." 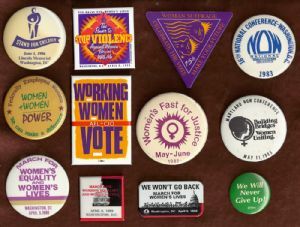 The Rally for Women's Lives was held on April 9, 1995 in Washington DC and is felt to be among the first and largest demonstrations to stop violence against women, as identified in the depicted button which reads, "The Power to Stop Violence Against Women Begins With Me." The event was viewed live by C-SPAN, and also covered by CNN as well as live news segments broadcast over MTV. Organized by the National Organization for Women (NOW), 200,000 people attended the rally. On August 26, 1920, Bainbridge Colby, then Secretary of State under Woodrow Wilson, issued the proclamation certifying the ratification of the Nineteenth Amendment to the Constitution. For twenty-six million Americans, the right to vote became law. Anniversary celebrations, marches, and rallies were held throughout the nation, including Washington DC, on the 75th Anniversary of that ratification, August 26, 1995. The post office issued a special commemorative stamp honoring Alice Paul, the founder of the National Woman's Party, as well as an additional stamp commemorating women's suffrage. At the Aberdeen Proving Ground in Maryland, the women's suffrage movement was commemorated by a march of over 25 women wearing flowing skirts and feathered hats, an event sponsored by the Maryland Tri-County Chapter of Federally Employed Women (FEW). The National Organization for Women (NOW) was founded in 1966, and the button above is from their 16th National Conference which was held in Washington DC. Among other actions taken in that year, NOW lead a successful campaign to renew the canceled TV series "Cagney and Lacey", (which stared Tyne Daly and Sharon Gless) which was among the first to portray women police officers as strong role models for women. Federally Employed Women (FEW) was established in 1968 and continues to have as its purpose the improvement of women's conditions in the federal workplace. They have worked to secure the appointment of qualified candidates to federal positions and end sexual discrimination and harassment. FEW members across the nation also became actively involved in the struggle to secure passage of the Equal Rights Amendment (ERA), prior to the expiration of the bill's deadline in 1982. As noted on the button above, "Women + Women = Power, We Can Make a Difference." The AFL-CIO was established in 1955 with the merger of the American Federation of Labor and Congress of Industrial Organizations. They are currently an umbrella organization comprised of about 57 unions and over 12 million working men and women. The AFL-CIO considers itself a champion for women in the workplace pertaining to such issues as equal pay for equal work, child care benefits, job security, health care, contraceptive equity, and protection from sexual violence and sexual harassment in the workplace. The Equal Rights Amendment (ERA) had been introduced in each session of Congress since 1923. It was passed in 1972 and sent to the States for ratification. In 1982, the deadline for ratification, it came up three states short of the 38 required for ratification. It was towards the end of the campaign, on May 18, 1982, that eight women began a "Women's Fast for Justice" in the state capitol of Springfield, Illinois. The purpose of this "silent witness" was to encourage state legislators to cast their vote for the ERA in June. A three-fifths passage requirement resulted in the amendment failing by four votes in the Illinois House. "Building Bridges - Women Uniting" was the theme of the Maryland National Organization for Women (NOW) Conference which was held on May 11, 1985. NOW was founded in 1966, and was originally made up of chapters with national leadership. State organizations, such as Maryland NOW, providing support and structure to the chapters within their boundaries, came later in 1976. On April 9, 1989 over 600,000 people rallied at the March for Equality and Women's Lives which was held in Washington DC, and as represented by the two buttons on this page. Organized by NOW, the goal of the march was to draw attention to several anti-abortion laws pending in the Supreme Court which threatened to overturn 1973's Roe v. Wade. Similar in cause to the 1989 event, another "March for Women's Lives", also organized by NOW was held in Washington DC on April 5, 1992. With the theme, "WE WON'T GO BACK", over 750,000 people including many celebrities, leaders from every pro-choice organization in the country, and students from over 600 colleges, rallied against what they saw as a threat to abortion rights via several cases pending in the Supreme Court. The United Food and Commercial Workers (UFCW) International Union was established in 1979, and represents about 1.3 million workers. As with the AFL-CIO, the UFCW also sees itself as an advocate for women workers, and sees the union as a way to provide better pay and benefits (particularly health) for working women. The UFCW also has a Working Women's Department which focuses upon the prevention of workplace violence, sexual harassment education and prevention, contraceptive equality, and voter registration. The UFCW button noted here simply reads, "We Will Never Give Up".